Anyone with a reasonable grounding in science will know that the environment on the moon is harsh and unforgiving. Why, then, would anyone want to live there? The answer, according to Ian McDonald’s new series, is money. The moon has an untapped wealth of minerals and with the discovery of extensive deposits of water-ice it has been possible to not only mine, but set up colonies. These colonies belong to the mining corporations and they not only control all the resources, including air and water, but are at war with each other. 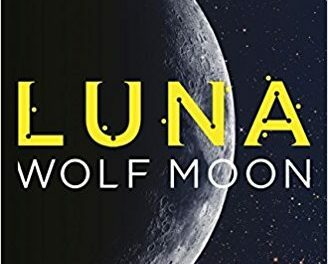 At the end of Luna: New Moon, the Mackenzie family (originally Australian and specialising in rare metals) did their best to wipe out the Corta dynasty (originally Brazilian and Helium miners). The few survivors are scattered. Lucas Corta has managed to get off the surface and is rescued by the Vorontsov’s (originally Russian and control the traffic between Earth and the Moon. 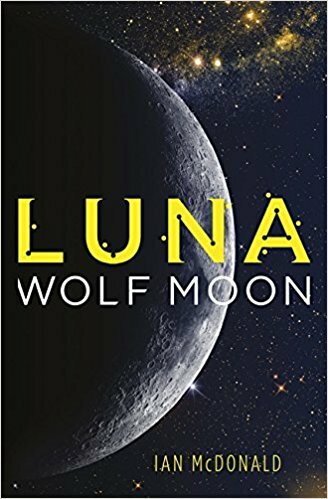 Having satisfied himself that the remnants of his family are as safe as possible (most under the protection of the Asamoah family (originally from Nigeria and who grow most of the Moon’s food), Lucas decides on an almost possible plan. He will go to Earth and negotiate enough influence to take back what is his from the Mackenzies. There is one huge stumbling block in the way of Lucas’s plans. Because of the lighter gravity, anyone going to the Moon from earth has a maximum of two years if they wish to return. After that, their bodies have adapted so much to the new conditions that re-entry into Earth’s gravity will probably kill them. Lucas is Moon-born. Thus he has to go through fourteen months of a punishing regime if he is even to have the slightest chance of surviving two months under the heavier gravity and higher air pressure. In the meantime, old Robert Mackenzie, kept alive now only by electronic systems, is preparing for a party for his hundred and fifth birthday. It is to take place at Crucible. This is a smelting facility powered by the sun. Huge mirrors direct the light into the smelters. To provide maximum production, this is on rails and constantly circles the equator so that it is always on the dayside of the Moon. During the festivities something goes wrong. The mirrors change their angles and the heat is directed onto the carriages where the party-goers have congregated. The result – destruction and mayhem. The belief is that the Corta family left code embedded in the system a very long time ago and it has just been activated. The main result is that Robert’s surviving sons and suddenly at each other’s throats, each vying for control of the Mackenzie empire. Instead of diplomacy as the main method of keeping stability there is now out and out warfare without anyone being quite sure who the enemies and allies are. Not only is Ian McDonald a brilliant writer, being able to convey the motives and machinations of the characters, he also paints a picture of what it would be like to live in circumstances where death is only the thickness away of the walls keeping the vacuum at bay. Everything in this novel is frighteningly plausible, from the dangers of the environment to the age-old nature of human greed. As in Luna: New Moon, the earlier volume, the central character is the Moon herself. Highly recommended.